Right now I am drinking the last of a bottle of champagne Geoff and I bought today to celebrate the success of Phoebe's eye muscle surgery. We took her to the hospital this morning at 8:30 and at 12 we were in the car on our way home, Phoebe the only one with red eyes. I held up pretty well, considering. I can't believe how worried and anxious I was in the days leading up to the surgery. I had signed the consent form a few weeks ago and the doctor told me about the risks of anesthesia and I was in knots about it, like my skin was too small. I felt ... antsy. I was texting with my childhood friend Dr. Kat the surgeon who said "All you can do is pray and trust the surgeons to do their job". Phoebe is sleeping now and she spent most of today nursing and cuddling with me. I was more than happy to oblige. Geoff took the week off work so it's nice to have him around to help provide support (emotional and otherwise). We go back to the doctor on Thursday for a follow-up, and then Monday for the 2nd follow-up, but from where I am sitting she looks pretty good. The wink is basically gone and aside from a very blood-shot right eye, Phoebe looks great and doesn't seem to be bothered at all by the procedure. I am so exhausted because it feels like it's been years since I've slept without waking up having panic attacks. Today when we finished lunch and put Phoebe down for a nap, Geoff and I took a nap and I slept better than I ever have in my life. I haven't gotten any pictures of her after the surgery, mostly because our camera is broken (yes, the camera I got for Christmas ... I think I dropped it awhile back) and I was busy holding her pretty much the whole afternoon so I didn't get the chance to take any pics of her little bloodshot eye. I'll try tomorrow. I mean, our camera works, but the screen doesn't so I have no idea how they're turning out and will have to wait to upload them to see. How ... old fashioned. The worst part of the surgery was the fasting. I woke Phoebe up at 3:30 to nurse her (she could have breast milk up to 4 hours before surgery so -- yay for nursing!) as we had to be at the hospital at 8:30 and I was being cautious, but at 9:30 she was so hungry and so sad because I wasn't nursing her. I couldn't even hold her because she was grabbing at my shirt and just so sad. She cried for 45 minutes, looking at me like "Why are you doing this, mom?" It was horrible. But she made it. I made it. Geoff was a rock, helping me not to cry too much after he handed our baby to the nurse and the anesthesiologist. So ... that's that. I'm hoping with the weight of this surgery off my shoulders I'll be blogging more. My mind has just been so wrapped up in it I haven't been very productive at all. Housework has lapsed. My workouts have lapsed. My diet hasn't exactly been great. But our little baby is doing okay and that's all that really matters. And I have a 1st Birthday Party to plan. Oh, bless your heart (and hers!) My oldest son might need eye surgery and we've put it off mainly because I am SO SCARED to do it. But we have other medical concerns involved. I am so glad all is ok and I hope there has been great success! And now you can breathe and rest easy! What kind of surgery??? Phoebe has 4th nerve palsy. The surgery itself was very straight-forward, and the pediatric opthalmologist is FANTASTIC. I wish she was my ob/gyn and Phoebe's pediatrician I love her so much! oh, poor sweetie. that bottom picture reminds me of when lily went in to have the toe surgery, jan 12, 2006, 10 days before we moved backed to virginia. to see her in that little hospital gown, in tears....it makes you feel so helpless. 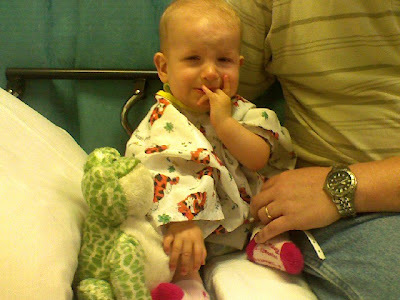 and after, she was on morphine and doped up so badly :( to look at her now...it was all worth it, the stress and the pain. i hope she will have a speedy recovery and glad that surgery is now behind you all. I was thinking about you guys all day yesterday. I am SO happy that everything went well and that you have that weight off of your shoulders! 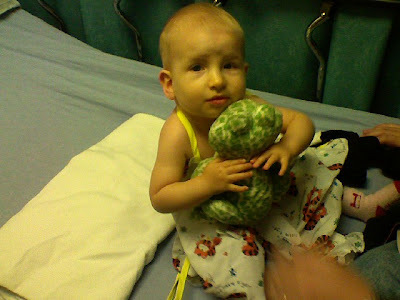 I am sure it is never fun to see your cild scared/sad etc., but the picture of her in the hospital gown is too precious. Happy to hear things have been succssful thus far and that she is doing well.